Caring for seniors with diabetes can be a challenge, but at PeachTree Place Assisted Living, we have the resources and services Salt Lake City and Ogden families need. Diabetes in the elderly is tricky because a new diagnosis can be overwhelming, and established routines become harder to keep up as we age. We offer many levels of care for our residents as their diabetes changes and they enter new stages of life. A 2012 report by the American Diabetes Association says that 22-33% of elderly Americans (those over 65 years old) have type 2 diabetes. Projections by the CDC suggest that the number of cases could increase by 4.5 times by the year 2050. These are troubling statistics, but managing diabetes is pretty straightforward, and with proper care, people live long, happy lives after their diagnosis. Adequately managed diabetes can still lead to severe complications like heart and kidney disease and nerve damage. The older a person gets, the more she is at risk for developing these conditions. This is why it’s important for caregivers to help seniors manage their diabetes, especially when they have trouble doing so on their own. Diabetes manifests itself differently in every person. However, there are some general ways that you can help your elderly relatives manage their diabetes. Create diabetic-friendly versions of favorite recipes. Make skin care part of your loved one’s routine. Examine your senior’s feet every day. Keep three days’ worth of testing and treatment supplies on hand in case of an emergency. 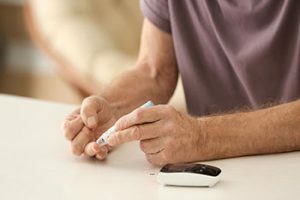 Over time, people with diabetes may need to change their treatment plan, like adding medication or insulin injections and adjusting doses of the medicine they already take. These changes can make managing diabetes confusing and complicated for seniors and their caregivers. Choosing to move your loved one into a senior care facility can remove that stress, replacing it with expert care for your loved one and peace of mind for you. There’s no better place than PeachTree Place Assisted Living. Our community boasts many on-site diabetic-friendly amenities, including a foot care clinic. We offer regular exercise classes and other fun community activities that encourage mobility. We also provide medication management services to help your loved one stick to her regimen. Caring for seniors with diabetes is challenging, but at PeachTree Place Assisted Living, we can help. Contact us today to learn more about our community and schedule a personalized tour of convenient, Salt Lake and Ogden area West Haven apartment community. Our friendly staff is always available to answer your questions.